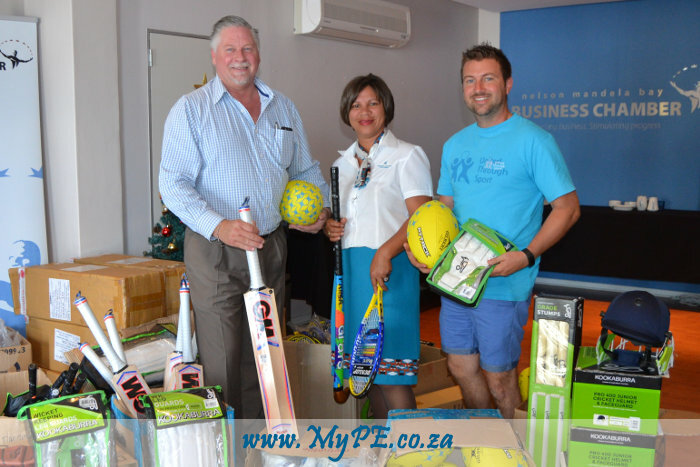 Nelson Mandela Bay Business Chamber CEO Kevin Hustler received sporting items to the value of R80 000 for the Business Chamber’s member company, United Through Sport. From left is Hustler, ACSA representative Elise Brown and United Through Sport Director Nick Mould. A surprise donation by Airports Company of South Africa (ACSA) Port Elizabeth International Airport to the Nelson Mandela Bay Business Chamber’s CSI project brought an early Christmas present to youth sport development in the city on 2 December 2016. The R80 000 donation of sporting items for the Business Chamber’s charity of the choice for the year, United Through Sport, is more than double the amount collected earlier in the year with the Mandela Day celebrations. In July various businesses donated sporting items, to the value of R35 000, which was handed over to Untied Through Sport on Mandela Day. The donating companies also took part in a fun morning of soccer games at Astra Primary School. The donation from ACSA Port Elizabeth International Airport’s Social Economic Development Committee, along with the earlier donations, will be used for youth sport development at some 80 schools across Nelson Mandela Bay. “This equipment will make a real difference to the children. The terrain where we play sport is often very hard on the sporting equipment and we are always in need of new equipment. We cannot expect our kids to compete in top sporting events, with inferior equipment. We are very grateful for this donation today – it will make such a difference to the children,” said United Through Sport Director Nick Mould. United Through Sport uses sport as a medium to promote child and youth development in disadvantaged communities of Nelson Mandela Bay. “We like to make a difference in the city of Nelson Mandela Bay and are happy to assist United Through Sport, in partnership with the Nelson Mandela Bay Business Chamber,” said PE International Airport Assistant Manager: Property, Zinhle Ntanzi. Nelson Mandela Bay Business Chamber CEO Kevin Hustler thanked ACSA for the generous donation. Earlier this year the company also supported another CSI initiative that the Business Chamber was involved in, the Armed Forces Day Legacy Project. “Sport has the power to change the world. This is the famous words of former president Nelson Mandela, and could not ring truer in this case. Thank you to ACSA for this donation, and we hope that United Through Sport will make good use of the items,” said Hustler.